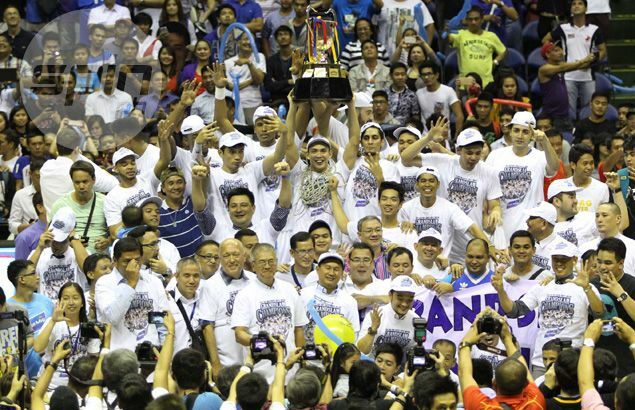 For winning the first PBA Grand Slam in the last 18 years, San Mig Coffee will be honored with a major award by the Philippine Sportswriters Association. THE longest reigning world Filipino boxing champion and the first Grand Slam achieving team in the Philippine Basketball Association (PBA) in the last 18 years lead the list of major awardees to be recognized during the Philippine Sportswriters Association (PSA) Annual Awards Night presented by MILO and San Miguel Corporation. World Boxing Organization (WBO) light-flyweight title holder Donnie Nietes and the entire San Mig Coffee team that completed a three-conference sweep in Asia’s first ever play-for-league last season will be honored in formal and elegant rite on the night of Feb. 16 at the 1Esplanade Mall of Asia Complex by the country’s oldest media organization. Nietes recently surpassed the seven-year reign of the great late Gabriel ‘Flash’ Elorde as the longest reigning Filipino world champion after successfully retaining his title against Carlos Velarde last November. Coached by Tim Cone, the Mixers on the other hand became the first PBA team after Alaska in 1996 to achieve a rare Grand Slam following their sweep of the entire season last year. Sharing with them a major award during the gala night which has the MVP Sports Foundation, Meralco and Smart as principal sponsors and the Philippine Sports Commission (PSC) as major sponsor are Youth Olympic Games gold medalist Gabriel Luis Moreno, Olympic figure skater Michael Christian Martinez, five-time NCAA men’s champion San Beda Red Lions, PBA Most Valuable Player June Mar Fajardo, and UAAP counterpart Kiefer Ravena. Completing the honor roll list for the major awards in the yearly affair also backed by the PBA, ICTSI, PCSO, PAGCOR, Rain or Shine, Globalport, Air21, Maynilad, Accel, and National University are rider Mark Galedo, golfer Daniella Uy, chess player Mikee Charlene Suede, wushu bets Jessie Aligaga and Jean Claude Saclag, the Philippine dragon boat team (dragon boat), Philippine poomsae team- (male under 30), Philippine poomsae team (freestyle), champion horse Kid Molave, and jockey Jonathan Hernandez. BMX racer Daniel Caluag is the 2014 PSA Athlete of the Year awardee. Other awardees earlier named were Cone (Excellence in Basketball), Mitsubishi (Hall of Fame), Princess Superal and Tony Lascuna (Golfers of the Year), Jean Pierre Sabido (Mr. Taekwondo), and the 1973 Philippine men’s basketball team (Lifetime Achievement Award). Also to be handed out by the media organization which turns 66 years old this year are the President’s Award, Executive of the Year, Sports Patron of the Year, Tony Siddayao Awards for outstanding athletes aged 17 and below, citations, posthumous, and the MILO Outstanding Athletes (boys and girls).